One of Teesside’s biggest housing providers, Coast & Country, is partnering with a security company to offer employment opportunities to the region. Coastline Security, which has been in business for just two years, has 60 available vacancies now and up to 200 additional positions in the next year. The recruitment drive follows the company’s significant contract wins to provide Security Industry Authority (SIA) licenced staff at 44 events this year. This includes some major concerts and festivals, as well as additional security and protection services at location television and film sets in the UK, including some upcoming Hollywood blockbusters. Coastline Security was keen to work with Coast & Country’s employability service because of its localised approach and social value ethos. The partnership will allow the companies to invest in local people, and commit to developing the skills of the industry’s future workforce. Each successful candidate will receive an SIA training package worth £600, which will include a fully-funded SIA Licenced Door Supervisor Course. Coast & Country’s employability service will cover the cost of the licence, course, work clothes allowance and travel expenses. Coastline Security is offering interviews and work trials to all that pass the initial training. Coast & Country offers its no-cost recruitment service to businesses and can support them through vacancy matching, applicant screening as well as maximising the funding support available. Although support is available for candidates of all ages, it also offers specific youth employment services to people aged 15 to 29 who are not in education, employment or training, including specialist support, information advice and guidance, training, mentoring, apprenticeships, job placements and further education to help them meet the needs of local employers. 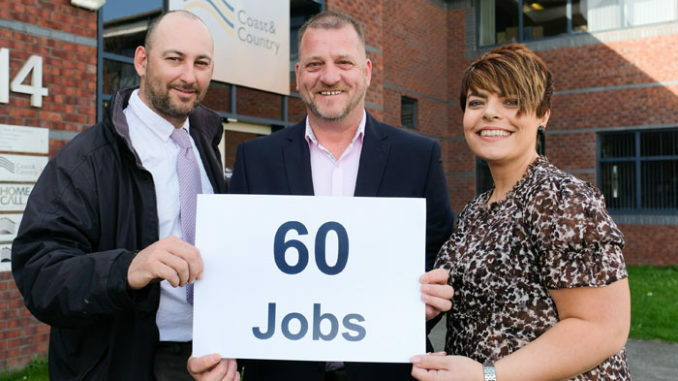 Johanna Watts, employer engagement officer at Coast & Country, said: “We value the many partnerships that we have at Coast & Country, as it is crucial for local and national companies to collaborate and invest in career prospects for people in our region. Kevan Garbutt, managing director of Coastline Security added: “It is fantastic that we can work with another local business, like Coast & Country, to support our community and provide job opportunities for unemployed people in the Redcar and Cleveland area. • Pictured above (left to right): Coast & Country operations manager Damian Whitefoot, Coastlinee Security director Kevan Garbutt and Coast & Country employer engagement officer Johanna Watts.